If you have studied Biblical languages, you know that even after two or three semesters in the classroom it can be easy to soon forget most of what you learned. After entering the working world, most of us who studied biblical languages in seminary or college find it challenging to pay much attention to them, let alone achieve our primary goals of exegeting and meditating on the Bible in the original Greek, Hebrew, or Aramaic. 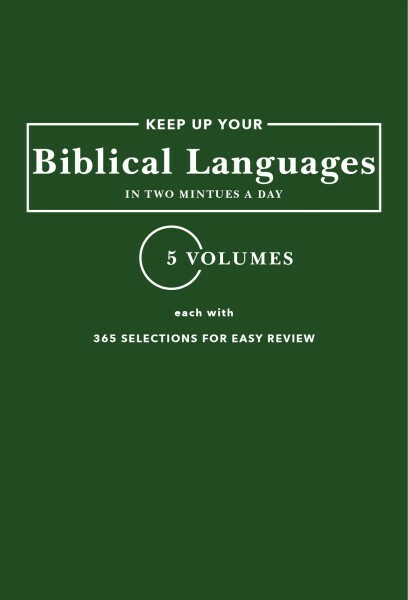 This series has been specially designed to build on your previous study of Biblical languages and help you read a small amount of the Bible in its original language every day in an easy, manageable, and spiritually enriching way. It does not replace the need for a grammar or textbook; rather, it complements grammatical study by helping you to build a robust vocabulary and to review morphology and syntax in a completely inductive way, and without using any grammatical jargon. In addition, the included Olive Tree Enhanced Strong's Dictionary will provide access to more expanded definitions, along with one-tap access to the definition in other resources you may have purchased or installed.